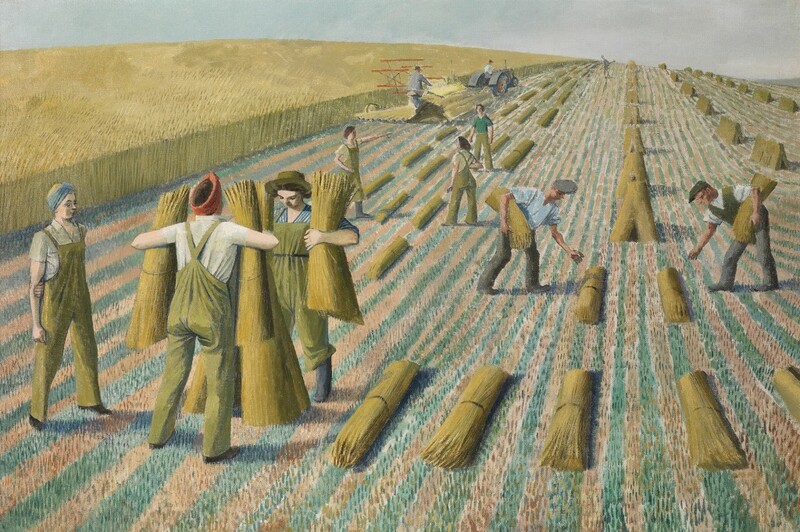 The current exhibition, ‘Evelyn Dunbar: The Lost Works’, at Pallant House Gallery, Chichester, includes many previously unseen pictures by this lesser known artist. 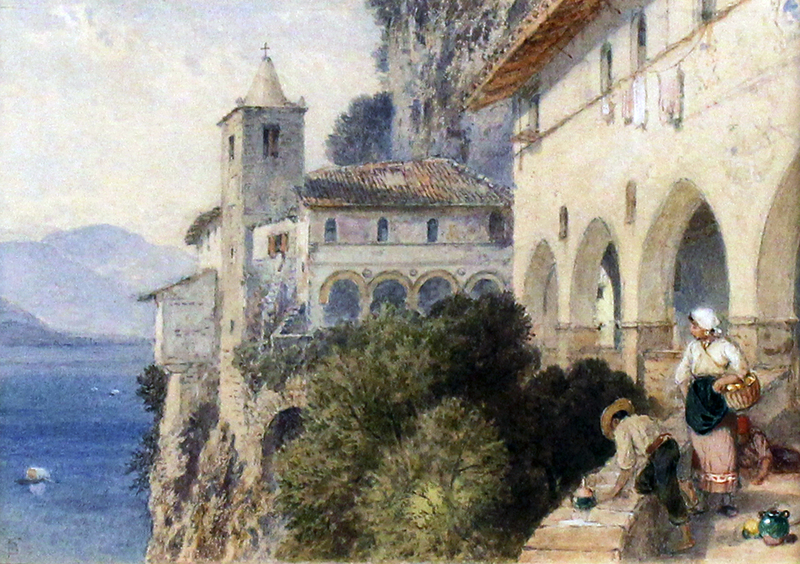 Many of these paintings and drawings had lain forgotten in an attic in Kent until their rediscovery in 2013. 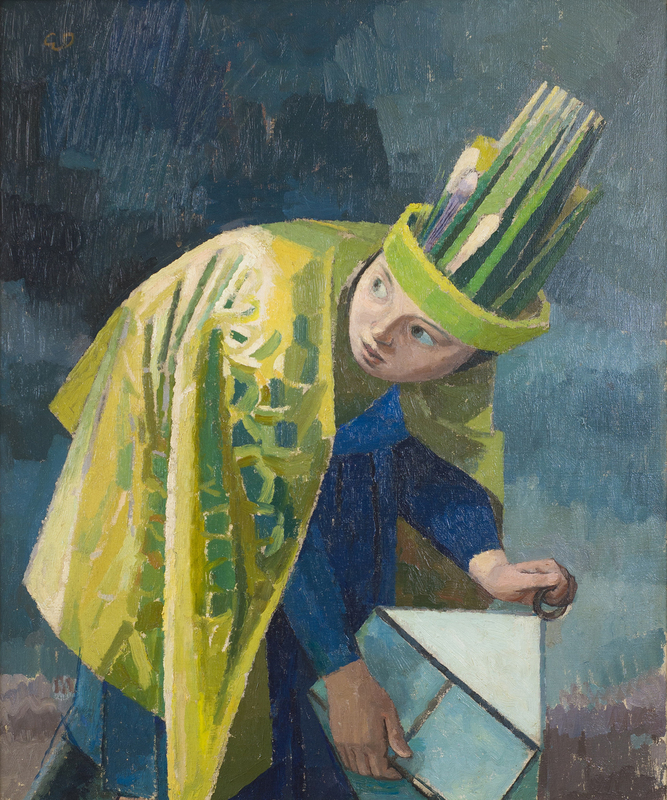 Evelyn Dunbar’s recurrent themes of the repeating rhythms of nature, the seasons and the year seem particularly poignant as we once again reflect on the coming of a New Year. 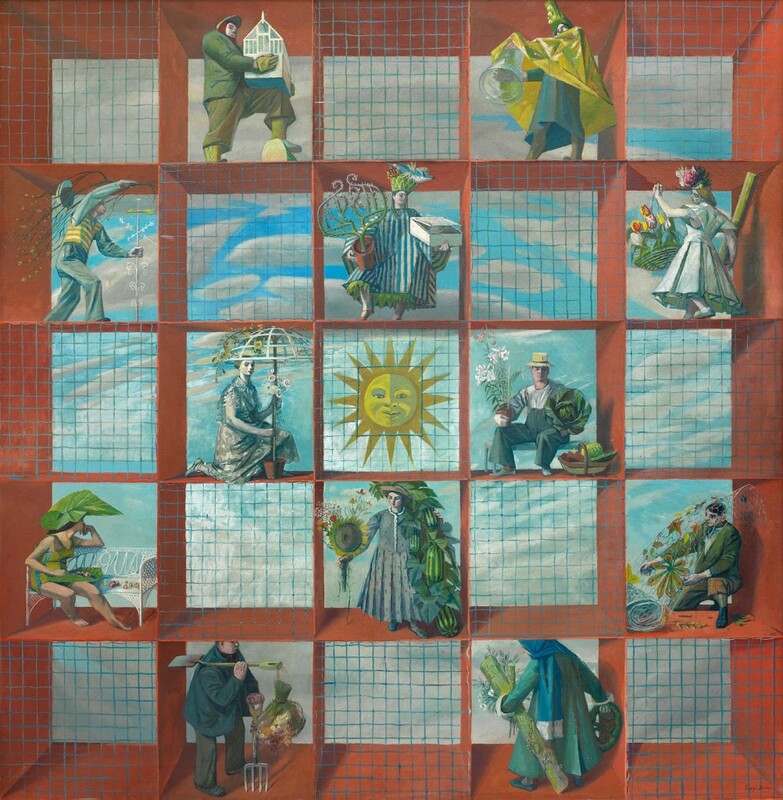 These themes are reflected in ‘An English Calendar’ painted in 1938. 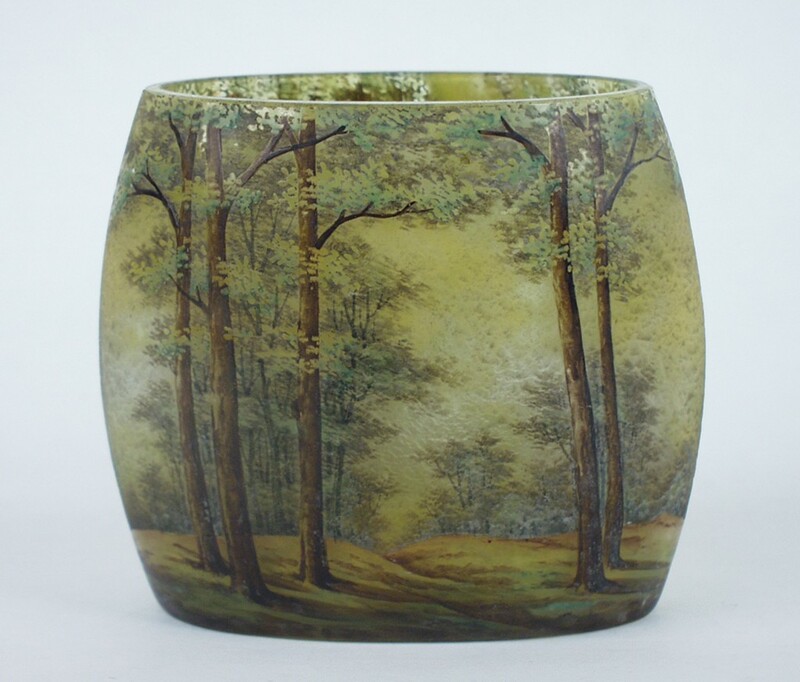 Here we also observe the artist’s passion for horticulture. Dunbar’s figurative study ‘February’ is filled with allegory. It is as though this figure has been disturbed. Her startled face is illuminated as she lifts a cloche and the first shoots of spring issue from her hat against the cold grey of a February sky. It displays something of the graphic qualities present in the artist’s illustrations. 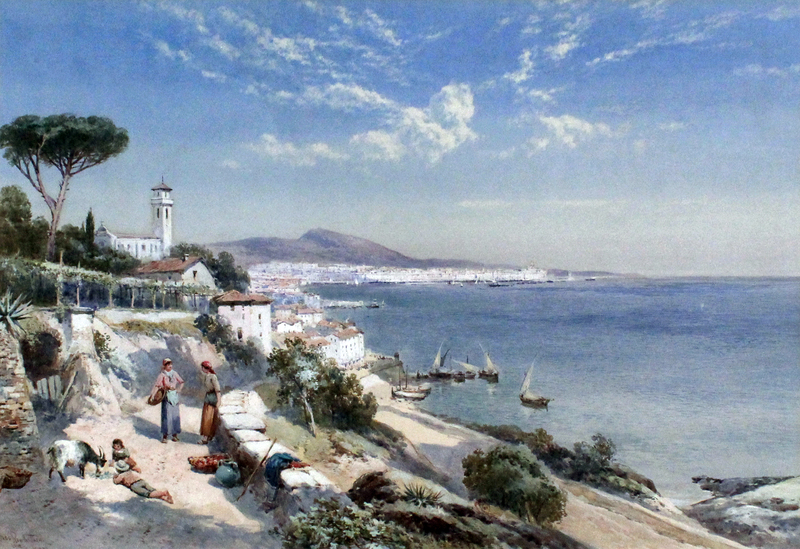 The exhibition is being held in the early 18th century house which forms part of the gallery. 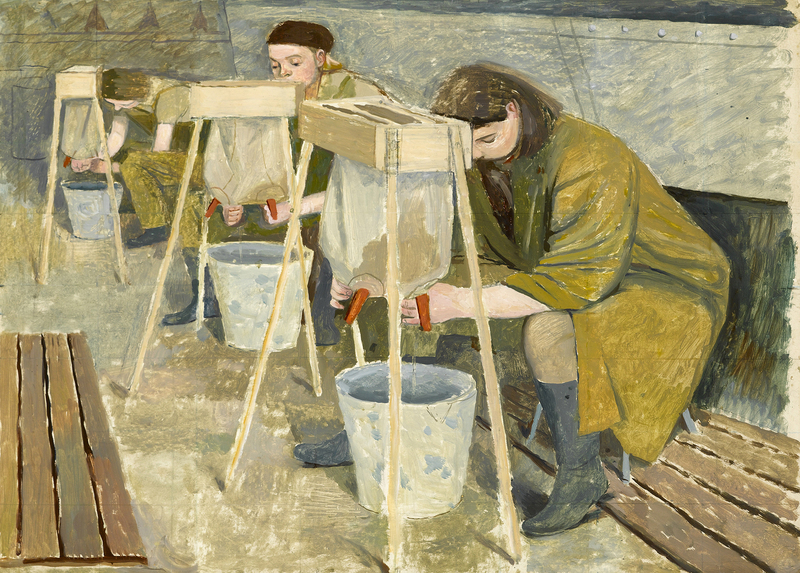 The influences of the 1930s British art scene on Evelyn Dunbar’s work is immediately apparent. 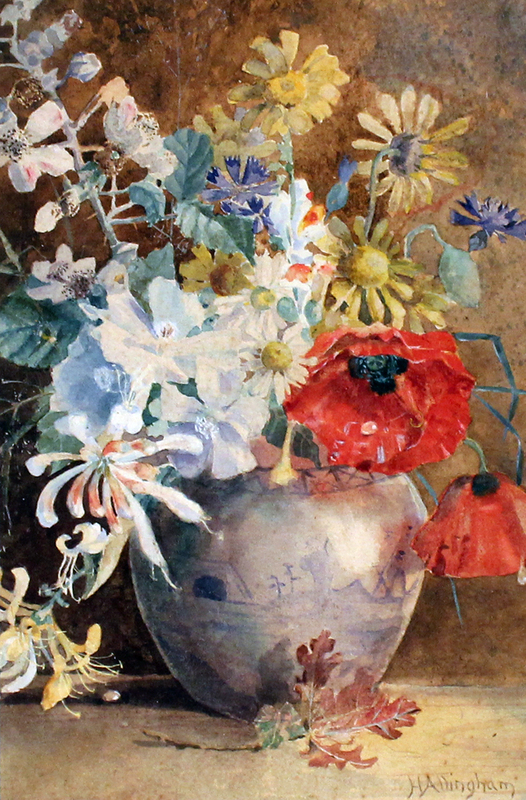 There is something of the attitude of Stanley Spencer, Paul Nash, Graham Sutherland and others in her pictures which connects her work to the Neo-Romantic movement of the time. Nevertheless there is much to delight in the familiar. Amongst the strongest images in this exhibition are her depictions of the home front painted whilst she was working as a war artist. Dunbar was appointed as an Official War Artist in April 1940. Sir Kenneth Clark provided the inspiration to set up the ambitious Recording Britain scheme which he saw as an extension of the Official War Artist Scheme. Artists, like Dunbar, were employed on the home front to create topographical views of the British landscape, architecture and people. These things were being threatened by bombing and possible Nazi invasion and were rightly considered to be important to the British nation and her identity. There is a poetry and rhythm in Evelyn Dunbar’s paintings from 1940 of ‘Men Stooking and Girls Learning to Stook’ and ‘Milking Practice with Artificial Udders’. These stylized depictions display Dunbar’s empathy with her subjects and love of the English landscape. 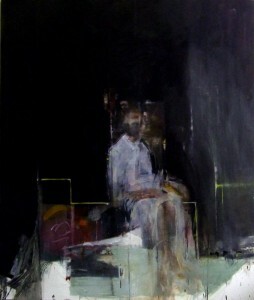 Her palette and the texture inherent in her handling of paint adds a vitality to her work. This charming exhibition runs until 14th February 2016 at the Pallant House Gallery, 9 North Pallant, Chichester, PO19 1TJ. For more information about ‘Evelyn Dunbar: The Lost Works’ and the gallery’s current exhibition program go to www.pallant.org.uk or telephone 01243 774557. I wish you all a peaceful and happy new year filled with blessing. By Revd. Rupert Toovey. Originally published on 30th December 2015 in the West Sussex Gazette. It’s been a decade since Toovey’s held the first ever auction of Contemporary Art consigned by Self-representing Artists. Due to other commitments the sales have been postponed until further notice, but those looking to get their Contemporary Art ‘fix’ have the perfect opportunity in Hove during the next fortnight. 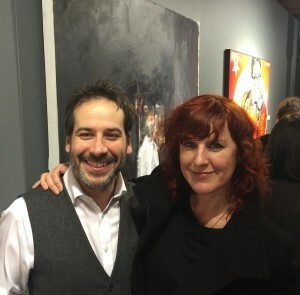 I was fortunate enough to be invited to a preview of the exhibition at the Naked Eye Gallery curated by Stefanra Dal Ferro that runs between the 11th and 24th December. The exhibition showcases eight different artists all of whom have the same 1.5m x 2m area to display their art. Curator Stefania states ‘Rather than the lines in the gallery separating the pieces, I wanted to create a sense of them melting together; simultaneously fighting differences and celebrating individuality.’ All the artists have responded by filling their space with one or two showstoppers. 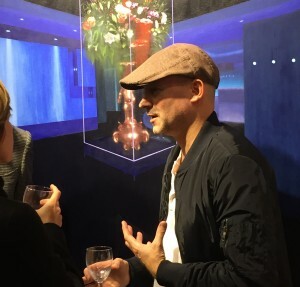 In the show, five of the eight artists had been included in at least one of Toovey’s Contemporary Art Auctions. It was nice to see a familiar eclectic mixture of styles, palettes and media all in a single venue and equally good to see the artists themselves. The exhibition walls were full of contrasts. Leaping into focus as you walk through the doors is an amazing Simon Dixon of Bo Diddley, popping with colour this acrylic on canvas sings against the unobtrusive grey background. 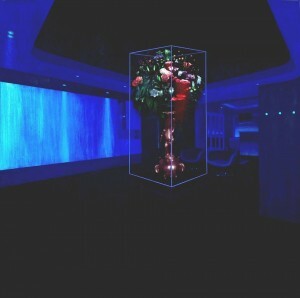 Beside this is ‘Wires’ by Sarah Shaw, a work that she describes as a cathartic experience to produce. I had a good catch up with Sarah, and was pleased to hear the positivity around her recent competition entries, solo shows and other exhibitions. Sarah’s art features on the soon to be released cover of Daughter’s album ‘Not to Disappear’ released by 4AD and a new print will be launched soon to coincide. 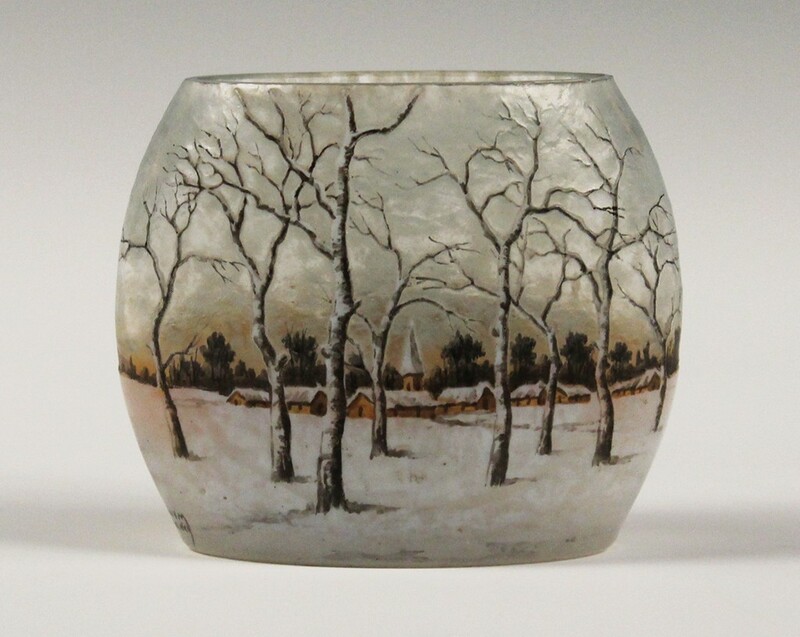 As an artist she has always been one to watch and I am delighted people are sharing my enthusiasm for her work. 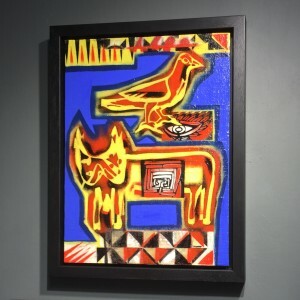 The inimitable Jim Sanders was offering two works, both breaking away from his usual palette of black, grey, white and red with bold splashes of colour. Jim was as upbeat as ever and I was reminded of the time I visited his house to write a Sussex Life article and being blown away by what I saw. Discussing this with another artist we both agreed that his home is akin to a ready made museum of his own work, quite an immersive and incredible experience for anyone lucky enough to visit. The work of David Levine, Joseph Rossi and Alex Binnie were no less impressive as I moved around to ‘Terranium II’ by Chris Kettle. I’ve said it before, and I will say it again, there is no contemporary artist offering such an interesting twist on the Still Life genre like Chris. His attention to detail combined with his unique vision delivers works that are simply breathtaking. I was buoyed to hear that his work was gaining a strong reputation and prints of his work were selling out fast. As a result a new series of prints are just about to be launched. The exhibition also provided me with the opportunity to meet some fascinating new people – not least the amazing framer Tim Harbridge, based in Montague Place, Brighton, and the equally brilliant Vaughan from Tin Dogs, who looks after a number of artists by reproducing their works as sumptuous screen prints. So if you are in Hove in the next two weeks be sure to pop into the Naked Eye Gallery in Farm Mews, BN3 1GH, to see the Dada+8 show! I recently found myself in Fittleworth in the company of artists, connoisseurs and residents delivering a lecture in celebration of art and artists in Sussex. Preparing the talk I returned to the Swan Inn which has welcomed famous artists, composers and authors over the centuries. The visitor’s book includes such illustrious names such as J.M.W. Turner and John Constable who both painted the mill at Fittleworth. Leading composers are recorded too. Amongst them is Edward Elgar who wrote many of his most remarkable works whilst living at Brinkwells near Fittleworth, including his Cello Concerto in E minor. Rudyard Kipling also visited the Swan Inn. Today the inn still provides hospitality and welcome under the generous custodianship of Deborah and Anthony Wyman and their son, Charlie. They bring a life time of experience to the task. 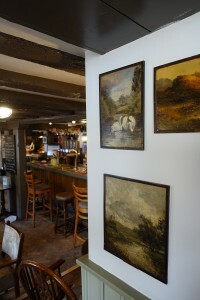 As we sit in the bar, surrounded by work by Rex Vicat Cole and others, I am reminded that many Victorian and early twentieth century artists were welcomed at the Swan Inn, donating work for their board and lodging. 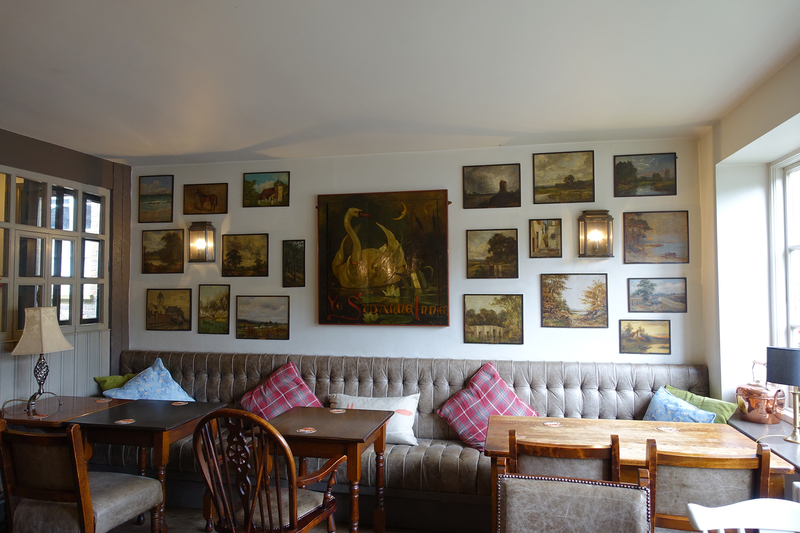 The paintings were originally hung in the dining room, framed by the wood panelled walls. I can remember the warm and gathering scene vividly. They were taken down for a time by previous owners of the inn. But Deborah and Anthony have lovingly re-hung them to the joy of Fittleworth residents and art lovers alike. I remark how lovely it is to see these paintings afresh in their new setting. Anthony is clearly delighted and speaks enthusiastically about the Swan Inn’s place at the heart of the community. He clearly loves this place and continues to invest in the inn and the local community. Anthony tells me excitedly about the new bedrooms and events room which are just being finished. From Norman times, and before, Fittleworth has provided hospitality and welcome. 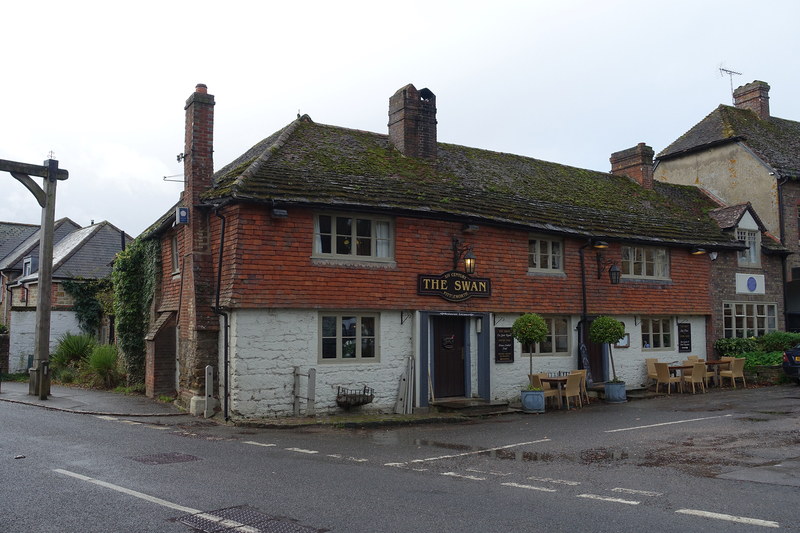 Since the 14th century the Swan Inn has been the heart of this welcoming Sussex village – a tradition it continues to this day. Christmas party bookings are still being taken and the Swan Inn, with its excellent cellar and food, is a great place to dine at any time of year. For art lovers there is the added pleasure of paintings by many leading Victorian and early twentieth century artists. You can be sure of a warm welcome. Our thanks should go to Deborah and Anthony Wyman and their son, Charlie for preserving such an important part of our Sussex social history, and for celebrating Sussex as a centre for artists over the centuries. To make a booking, or to find out more about the Swan Inn, Lower Street, Fittleworth, West Sussex, RH20 1EN, telephone 01798 865429 or visit www.swaninnhotel.com. By Revd. Rupert Toovey. Originally published on 2nd December 2015 in the West Sussex Gazette.